His Grace, Metropolitan Zachariah Mar Nicholovos was born on August 13, 1959 to the famous Poothiyottu family in Mepral. His boyhood name was Cheriyachen. He has three brothers and one sister. His Grace Metropolitan Kuriakose Mar Coorilose ordained him to the Holy Diaconate on January 4th, 1986 and to the Priesthood on May 16, 1990 at his home parish St. John's Church, Mepral. His Beatitude Mar Baselios Paulose II tonsured him as a monk on August 5, 1993 at Moovattupuzha. His Holiness Moran Mar Ignatius Zakka Iwas I, Patriarch of the Syriac Orthodox Church of Antioch, consecrated him as Metropolitan on August 15, 1993. Metropolitan Mar Nicholovos served as the Ecumenical Secretary of the Malankara Syrian Orthodox Church and taught as a professor at the Malankara Syrian Seminary at Mulanthuruthy. His ecumenical activities led him to serve as a member of the Syrian Orthodox - Roman Catholic Dialogue Commission. His Grace remains very active in the Ecumenical and Inter-Religious movements. Metropolitan Mar Nicholovos was appointed as the Assistant Metropolitan of the American (Northeast American) Diocese in 2002. His Grace currently serves as a Central Committee member of the World Council of Churches, and as a member of the Board of Trustees for St. Vladimir's Orthodox Theological Seminary, New York. 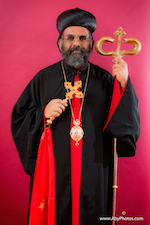 On February 26th 2011, following the retirement of His Grace Metropolitan Mathews Mar Barnabas, His Holiness Baselius Mar Thoma Paulose II appointed Metropolitan Zachariah Mar Nicholovos as the ruling Metropolitan of the Northeast American Diocese.